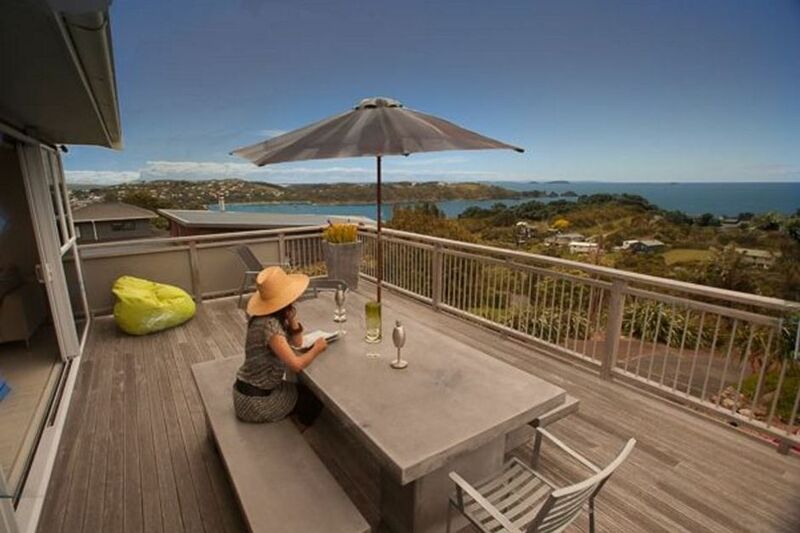 Bayview Retreat sits on a ridge which has commanding views over the gulf islands, the Coromandel and back towards the North Shore and Eastern bays of Auckland. This is a great place to unwind in the peaceful environment and enjoy the views from the open plan upper floor and large deck. There’s space for friends and family to stay and a big back garden planted with olive and lemon trees. We love this location for the easy access to Little Oneroa beach and dairy (10 mins walk), Sandy Bay and Hekerua Bay. It is only a five minute walk to the bustop and 20 mins to Oneroa village with all it’s shops and cafes. We also enjoy visiting the local vineyards some of which can be reached on foot or by bike. •1 night stays available with $150 surcharge to cover cleaning and linen: Sunday to Thursday night, available to book anytime except during long weekends and Christmas New Year. Friday and Saturday nights only available to book at the earliest, during the week beforehand. Please enquire. The property suited our needs well. It was well equipped and the view is stunning. The beds were comfy and there was plenty of room. I agree with another review which stated that the bunks need attending to - the bottom bunk is sagging in the middle. I would not want a child sleeping there (we didn't use it). I would have thought this would be priority. Another minor comment - only two extra toilet rolls were supplied so we had to buy our own, which was a bit of a pain. Amazing views & great open plan living. Amazing views, lovely light filled rooms. All you can hear in the mornings is the birdlife. The open plan kitchen/living area was really easy going. We bbq’d quite a lot on the deck (photos don’t do the views justice) and the back garden was perfect for lounging around in under the trees. Our only concern was the bunk bed seemed a little precarious and possibly needs a little stabilizing / reinforcement. Overall a really easy and enjoyable place to stay, lots and lots of bookreading on the deck went down. Would definitely recommend. Beautiful place. Well setup for an awesome Waiheke getaway. Awesome location, views and house for a family or group getaway. It was the perfect place for a relaxing catch up with friends. It was the perfect place for a relaxing catch up with friends.Gorgeous house with beautiful views. Really generous rooms with comfortable beds and nice linen. There are various places to go sit outside and relax as well. The kitchen is large with everything that you may want if you are self catering. The property is an easy 20 minutes walk to Oneroa, where there are plenty of cafes, restaurants, shops (incl groceries). There is a frequent bus service as well. I'd love to come back one day!